(1981) "Eye in the Sky"
(1) "Eye in the Sky"
(2) "Children of the Moon"
"Eye in the Sky" is a 1982 song by the British rock band The Alan Parsons Project from the album Eye in the Sky. It hit #3 on the Billboard charts in the U.S. in October 1982, #1 in both Canada and Spain, and #6 in New Zealand and was their most successful release. The instrumental piece entitled "Sirius" segues into "Eye in the Sky"' on the original recording. Lady Antebellum's 2011 hit "Need You Now" has been heavily compared to the chorus. The 1:54 minute instrumental piece entitled "Sirius" immediately precedes "Eye in the Sky"' on the original recording, which then seamlessly leads into "Eye in the Sky" as a second track. On the single release, "Eye In The Sky" appears on its own, with "Sirius" edited out; this is the version that was usually played on pop radio at the time. However, Album-oriented Rock (AOR) and classic rock stations almost exclusively include the "Sirius" intro. "Sirius," meanwhile, has become a staple of many big-time college and professional sporting arenas throughout North America, and is best known in the U.S. as the instrumental song that was used to introduce the starting lineup of the Chicago Bulls for home games played at the old Chicago Stadium and then the United Center in the 1990s, during their run of six NBA championships between 1991 and 1998. The instrumental piece (along with "Eye in the Sky") will be also used as the entrance song to the Chicago Cubs starting in the 2017 season. "Eye In The Sky" is heard on the 2002/2003 video game compilation Activision Anthology on the virtual tape deck in the main menu. Asia Featuring John Payne released a cover of this song on their album Recollections: A Tribute to British Prog in 2014. Synthpop artist Parralox released a cover of this song as a single in 2013. Folk rock artist Jonatha Brooke covered this song on her 2004 album, Back in the Circus. Israeli artist Noa covered this song on her 2002 album, Now. Rapper Immortal Technique sampled the song on his 2011 album, The Martyr. Gary War covered the song on his 2008 album New Raytheonport. "Ja no brillen mai" by Joan Dausà i els Tipus d'Interès (in Catalan). The song was covered in 2013 by Red Band and Marina Maximilian Blumin on Israeli TV show The Red and Dvir Show (המופע של רד ודביר). An instrumental cover of the song was released on jazz guitarist Gilad Hekselman's 2013 album "This Just In". Critics in Europe and North America have pointed to similarities between the melody of Lady Antebellum's 2010 single "Need You Now" and Eye in the Sky. ↑ Trust, Gary (27 October 2009). "Backwards Bullets: This Week In Charts 1982". Billboard.com. Retrieved 8 July 2015. ↑ Cohen, Ben. "The One Record the Warriors Can’t Take From the Bulls: Even as Golden State closes on a historic 73rd win, Chicago’s pre-game music still sets the standard," Wall Street Journal (April 12, 2016). ↑ "Eye in the Sky in Canadian Charts". CollectionsCanada.gc.ca. Retrieved 15 June 2012. ↑ "Eye in the Sky in Canadian Adult Contemporary Charts". CollectionsCanada.gc.ca. Retrieved 15 June 2012. ↑ "Artists". InfoDisc.fr. Retrieved 8 July 2015. 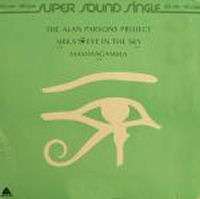 1 2 "The Alan Parsons Project: Eye in the Sky (song)". Retrieved 8 July 2015. 1 2 "I singoli più venduti del 1982". HitParade Italia (in Italian). Retrieved 8 July 2015. 1 2 "The Alan Parsons Project". MusicVF.com. ↑ "Top 100 Singles". RPM. republished online at CollectionsCanada.gc.ca. 37 (19). 25 December 1982. Retrieved 8 July 2015. ↑ "The CASH BOX Year-End Charts: 1982 Top 100 Pop Singles (As published in the December 25, 1982, issue)". Cashbox. Retrieved 8 July 2015. ↑ Hermann, Andy (23 February 2004). "Jonatha Brooke: Back in the Circus". PopMatters. Retrieved 11 October 2015. Even better is her completely unexpected take on that old Alan Parsons Project chestnut, "Eye in the Sky", which she reclaims as a heart-wrenching folk ballad. ↑ RODGERS, D. PATRICK, "Alan Parsons' Camp Alleges Lady Antebellum Rip-Off," Nashville Scene (NOV 11, 2010). ↑ "Is this an Awards Show or What?". NOW Toronto. 14 February 2011.